But with millions of people attending college via the Internet, what makes a successful online student? How do you really balance work, life, family and college? Participate in the virtual campus (VC) on the first day of a new session. – By setting the stage of logging in on your first day of class, you can better prepare yourself for the upcoming semester. Review the materials provided by your professor and that way you can be ready for discussion during your first online classroom experience. Check the virtual campus six or more times a week. – Setting aside a consistent time throughout the week to check into the VC, even from the CTU mobile app, may be beneficial. According to a study by psychologist Jeremy Dean, it takes an average of 66 days to form a habit.4 For example, if you log in to the VC every morning at 8:00 a.m. (even on the weekends), by the time your third month of school comes around, it may not take any additional effort to check in each day. Commit to logging in to course pages on the VC for six hours a week. – One of the biggest lures of online learning can be flexibility. While it may be tempting to skip a few hours of school to spend time with family or friends, a commitment of at least six hours per week may greatly benefit your education. Schedule visits to the VC when assignments are due. – You can also make a habit of logging in to the virtual campus each time an assignment is due. Even if you’ve turned it in early, it can’t hurt to double check the assignment requirements and make sure your materials have been successfully submitted. Attend live chats or review archived chats each week. – It can be important to review course materials and attend live sessions, not only on the first day of class, but every week in order to ensure that you stay on top of your requirements and your education as a whole. Pace yourself and stay consistent throughout the course. – Your education can assist you with your future, so continuing to make your studies a priority may help you over time. For example, if you allot time for a study schedule each week rather than cramming for an exam, sticking to this commitment might help keep your stress levels down. Review feedback from faculty regularly. – CTU professors and staff are there to help you. Check in with your teacher or academic advisor as often as you need. If you are struggling to grasp a concept in a particular class, our education professionals can help point you in the right direction for additional assistance or tutoring. Put your work through the originality verification tools before submitting. – CTU provides resources to check for duplicate or quoted writing. It can be beneficial to make sure your assignments are 100% original or cited correctly according to your course requirements before turning them in. Engage with other students in your classes. – It can be important to immerse yourself into your online education community. Though CTU distance learning offers the ability to disconnect from school, it can be beneficial to bond with your classmates to bounce ideas off one another, ask questions and engage in conversation. Develop an approach to education that works best for you. – A particular routine or style of learning may not work for everyone. At CTU, we offer a variety of methods to learn through the virtual campus, such as course videos, slideshows, audio files and reading materials. Choose the best mediums for how you learn and use them to your advantage. 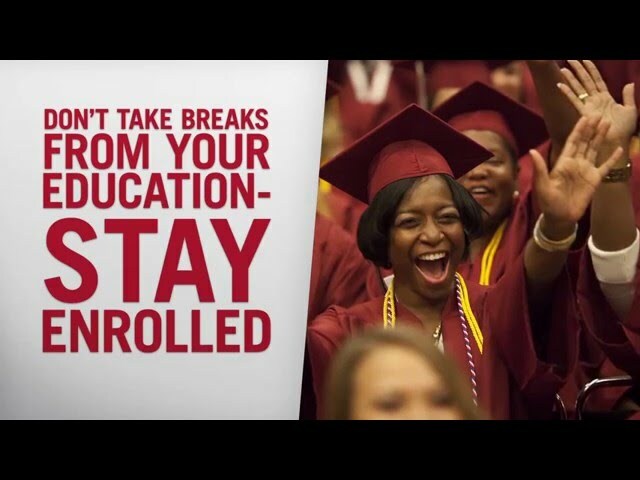 Don’t take breaks from your education – stay enrolled. – It may be tempting to take time off during the summer or winter holidays or take a break to deal with major life events. However, if you do so, you may not complete your degree as quickly as originally planned. If you do decide you need a break, it may help you to contact your academic advisor and talk through the situation. Now, it’s time to set yourself up for success. Through innovative technology and experienced faculty, Colorado Technical University’s mission is to provide industry-relevant higher education to a diverse student population, enabling the pursuit of your personal and professional goals. Whether you seek an online education or attend classes at our Aurora or Colorado Springs campus locations, CTU offers a broad range of degree programs in nursing, business and management, engineering and computer science, IT, healthcare, project management, security studies and criminal justice. Learn more about CTU’s degree programs. CTU cannot guarantee employment or salary. Find employment rates, financial obligations and other disclosures at www.coloradotech.edu/disclosures. 1. "Enrollment: Do You Have Information on Postsecondary Enrollment Rates?" National Center for Education Statistics (NCES). Accessed July 5, 2017. https://nces.ed.gov/fastfacts/display.asp?id=98. 2. "Fast Facts." National Center for Education Statistics (NCES). Accessed June 16, 2017. https://nces.ed.gov/fastfacts/display.asp?id=80. 3. "11 Habits of Highly Successful CTU Students." Colorado Technical University. January 22, 2016. Accessed June 16, 2017. https://youtu.be/GZUTJurqGAM. 4. Dean, Jeremy. “Making Habits, Breaking Habits: Why We Do Things, Why We Don't, and How to Make Any Change Stick.” Richmond: Oneworld, 2013. Accessed June 16, 2017.